This new Karatepraxis Quick and Dirty video is a summary of several training sessions I did in the last weeks. We played with padcombinations. Sometimes for speed and flexibility, sometimes just to hit hard. The usage of pads has enormous potential for Karateka. It brings feelings into techniques. It brings information to both partners in front the pad as well as behind it. Stay tuned and subscribe to our karatepraxis YouTube channel. If you like our new one, please like, share and comment it. 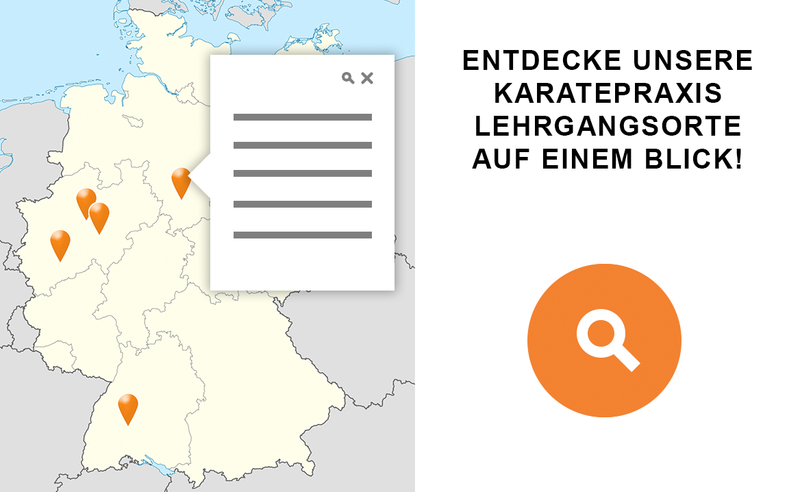 Der Inhalt der Heian-Kata-System-Bunkai Lehrgänge ist für alle interessierten Karateka geeignet. Natürlich und insbesondere auch für Unterstufe und Mittelstufe. Denn es sind Eure Katas, die Ihr als Teilnehmer dann „sofort“ richtig verstehen lernt. Warum mache ich das in der Kata so und in einer anderen so ähnlich, aber doch ein wenig unterschiedlich? Warum mache ich bestimmte Techniken 3x hintereinander? Lerne ich Angriffe in den Katas? Lerne Dein Karate, Deine Katas neu kennen. Wir hatten gestern zum dritten Mal einen tollen Kata-Bunkai Lehrgang mit Christian beim ASV Bingen. Christian hat es auch diesmal wieder geschafft den Teilnehmern eindrucksvoll zu vermitteln, wie viel praktisch Anwendbares in unseren Katas steckt. Die Kata ist hier nicht mehr ein Kampf gegen einen oder mehrere imaginäre Gengner mit starrem, aber wirklichkeitsfremden Ablauf, sondern wurde in meiner Assoziation zur Werkzeugkiste aus der man sich Hammer, Zange oder Schraubenzieher dann herausnimmt, wenn man sie braucht und sie so einsetzt, wie die Situation das erfordert. In allen trainierten Kombinationen und Drills konnte man die Sequenzen und das Grundkonzept der jeweiligen Kata (gestern Tekki Shodan und Heian Yondan) ohne Probleme wieder erkennen. Diese Sequenzen bekamen jedoch auf einmal eine überzeugende SV taugliche Anwenbarkeit. Das ist für mich das Karate der Zukunft; gerade, weil ich erst vor kurzem wieder festestellen musste, dass es immer noch Vereine gibt, die Kihon, Kata und (Wettkampf)Kumite streng getrennt nach dem Motto: „shall the three never meet“ und von fern jeglicher praktischen Anwendbarkeit trainieren. This Karatepraxis Quick and dirty Video Shows Tekki Shodan Applikation with some alternatives for the defender. It was filmed on my recent seminar in Bingen, Germany. In my opinion kata tells us techniques, awareness, tactics, and alternatives. If you like it, please leave a comment, like it and share it. If you’re interested to organize a karatepraxis seminar in your country, town, dojo – please get in touch. Our website is one of only few martial arts pages where people can rate seminars they have attended. In fact the reviews page is after „home“ and „dates“ the most seen one in karatepraxis.com. Through this one can get a sense of what to expect on our seminars. Now, more than 600 seminar participants have rated karatepraxis. That is an amazing amount of feedback for us. Thank you for your confidence in our karate content. I came across karatepraxis on a seminar in Giesen, Germany and I am thrilled to have participated, since it was so much fun and I learned that Bunkai can be a realistic basis for selfedefense. Really enjoyed Christian seminar last Sunday in Wantage, UK. A great practical view of karate drills and kata bunkai. Hopefully, there will be future chances to train with Christian in the UK. Left with a big smile on my face! Thank you. Karatepraxis is mind-boggling. I’ve attended a heian kata system bunkai seminar. Amazing! So much stuff is integrated in the heian kata. So much I haven’t seen befor. So much seems to be lost but Christian works on it and shows the old treasures in defense-matters. That is karate! Christian is an excellent instructor with a deep knowledge of highly effective and practical karate, I attended his first ever UK seminar in Wantage, England and was blown away by how simple and destructive his methods can be when put to use. The seminar had excellent content and some great humour thrown in. I very much look forward to training with Christian and his uke daniel again in the future. Thank you very much for your time and effort in coming to the UK to teach. Karatepraxis seminar with Jürgen Höller (Full Contact Karate – Shobushinkai) and Christian Wedewardt (Ten-Kyo-Ryu). Jürgen taught about distances, related techniques and „contactmanagement“ and Christian referred Jürgens content to kata Heian Yondan where everything is about close distance and contact management. That gave me a new perspective on this kata in terms of fighting. I like to have more of this! Karatepraxis Heian-Kata-System-Bunkai was one of the best seminars I’ve attended. It changed my point of view for good. Kata will never be the same for me. A seminar with high quality content, delivered with a good portion of humor and everything we did in partnerwork was in logical, fluent moves. It was well worth to travel from Switzerland to Germany for this event.